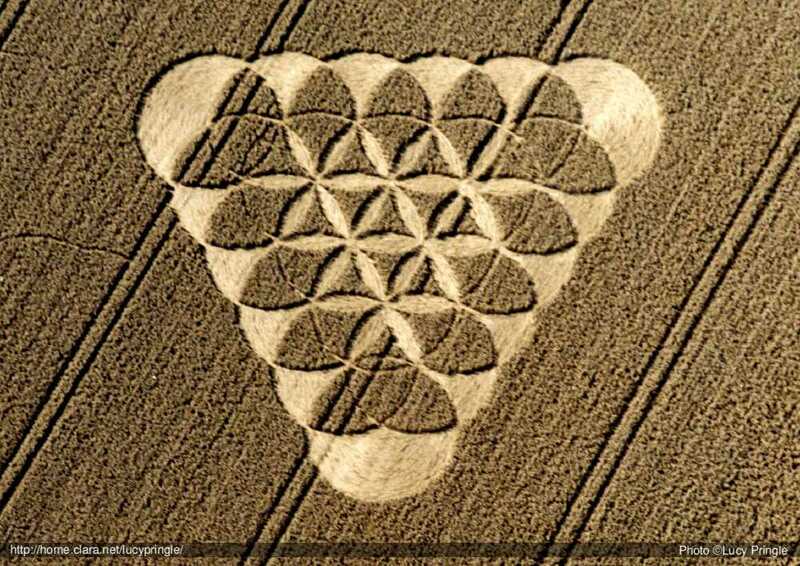 There are 21 circles on the cross in the above photo of the crop glyph. It is quite clear that the formation on the left represents the chakra system. The seven chakras of the human body are generally depicted to be circular "wheels" or flowers along the spinal column, with the seventh or crown chakra atop the head. The second picture is Egyptian and also represents the chakra system with 'The Swallower Beast's snout between the third and fourth chakra. It is said that if one does not make the leap to the heart chakra (the fourth) that one must be reincarnated once more until one makes it. In the second picture, the glyph above the balance beam is the 8th chakra above the crown - and may correspond to the 'white horse' which is explained below. 5-2-05 - DREAM - There were no people involved in the beginning of this dream. I was looking at a computer screen. The topic was Bible archaeology. That said, it was about people, not about places. The list started at the bottom with 021 and the color was light brown in a triangle shape. The next person up above that was 022, and the color was light blue, succeeding upward in alternating numbers and colors, all in triangle shapes nestled against the one below it. When I got to 045 I stopped because there was no text in any of these spaces. There was no proof they existed at all. An old, thin grandfatherly-looking man , dressed in a brown robe and leaning on a staff sat next to me and looked at the screen, not understanding. He said, "What does it mean that there is no proof that I existed?" NOTE: Is the reason there is no archeological proof of Jesus' existence because he died in another country - America! ??? A young man named Joseph from Kenya, told of a dream that seemed to be more of a vision. People were running from mean-looking men who were carrying pitchforks. Much later a vision was reported on-line telling how a man had been taken to a place where he saw "the 21". This was a group of 21 people on a platform arranged in a triangle. At the point of the triangle was a woman who told him , "I am the leader, you are the protector." A mark was put on his aura to show that he was the protector. The mark was in the shape of half a heart; not a regular heart, but like those used on valentine cards. If you line up 21 people arranged into a triangle, you will have six people on each side, for a 666 coding - the number of man. This was the phone number given to me by my Father in a dream. 6-4-04 - DREAM - My father called on the phone to give us a list of chores that had to be done. I started to write them down on a big tablet as he dictated them. He started out by saying, "I want you to read the book I wrote. There is a copy of the video they made of my book in the upstairs closet." Before I could say anything, my friend Jeanine ran upstairs to get it. I wanted to run upstairs too, but he was still talking. He said, "A copy o fmy book is in the Law Library at the University of Louisiana." I scrawled Louisiana on the tablet. He said, "I left a treat for you in the closet upstairs as well." He hung up and I dashed upstairs after Jeanine. She didn't know about the treat. I got up there and in the closet was a white covered dish. I lifted the lid and on the plate were 6 donuts and 6 large cookies and each one was covered with a different color frosting and topping on the the frosting ranging from chocolate to white vanilla with white coconut. I took the time to separate the cookies from the donuts so I could see them all and then feeling full of joy. I reached for the phone to call my Father and thank him for the wonderful scrumtous cookies and donuts and tell him I would always buy my cookies and donuts at Heinemanns because that's who delivered them. My father's phone number was 21. Matthew had a very short dream the other night. -.about the only thing he was able to see was the calendar.- .this time he was able to get a year as well as a month. The month was July, the year was 2567. Now, I added up the time frame, and I have somewhat of a theory. - .so just bear with me because it's only a "What If" theory. Okay, 2,567 days = 7 years and 12 days. Matthew dreamt this on the 9th. So, 7 years and 12 days from the time Matthew had this dream would make it June 21, 2011. Now, a lot of Christians subscribe to the tribulation/mid-tribulation/post-tribulation ideology, which is supposed to be 7 years long. What I'm wondering is, if his dream could possibly signify that the beginning of this tribulation has started, or is just about to start So, if the period of this tribulation is exactly 7 years, and it's due to start sometime soon (if it hasn't already) then that could conceivably mean that the starting date, from the date of Matthew's dream to the exact start of the 7 year period, could be June 21st....11 days from now. The Divine Name I AM THAT I AM (GR 543) is God's memorial name unto all generations. God defined it this way so that when the Lord Jesus Christ came to earth and declared this name, there would be no question as to His identity as Almighty God. The significance of this relation is overwhelming: The Gospel of John, the I AM Gospel lies on Spoke 21! It also integrates with the Isaiah 43 - John connection, as discussed in the Inner Wheel article The Eternal I AM. Furthermore, it integrates with the Shin KeyWord (Shem, Name)! And beyond that, the pronoun "Asher" is synonymous with the pronomial particle indicated by the letter Shin, which is maximized on Spoke 21 in the Book of Ecclesiastes! Endless wonder! Divine Perfection! 3 = 1 + 2 = Sum(2). The Number 2701 is the 73rd Triangular Number, and both 37 and 73 are prime. In fact, they are palindromic primes! Oh my child: Welcome to my home. You are welcome here any time. I know you have many questions, but for now we will try to share conversation without interruption. That is key. To be clear as a channel is key - otherwise the information des not get translated correctly. You peek out of one eye to get the words on the paper, yet the meanings will be clear even if it does not. The answer to all questions is LOVE & LIGHT. Through LOVE & LIGHT one achieves JOY. There is no other way. Go and be happy. We will work on more definitive answers at another time. Joe's note: See page 539 of The Secret Doctrine concerning the number 543. You and Matthew seem to be right on the money again! Thanks for sharing all this with us. We feel that it is of great importance. I have followed "The 21" for quite a few years. It is late, so I will just give some links here. Interestingly, I had big coincidences related to the town of Morgan Hill back in 1990. After I read the vision, I drew a diagram of The 21 and realized it was a 6 x 6 x 6 triangle. I didn't know about triangle numbers back then. 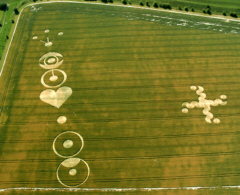 The 1991 Barbury Castle triangular formation has the same pattern in terms of dimensions. Below is a link to a 21 fold crop formation from last season. 8-7-01 - DREAM - I had the same dream for the 4th time this week. But this was like a flash 'knowing' not the dream itself. I'm certain it was about 'The 21' again. 8-7-2001 - I seems it is time to bring up this topic again because of a dream I had last night. I didn't know quite how to research the dream since the internet does recognize the word 'the' in a search, so I ended up with 31,000,000 (million) sites which I had to whittle down using other words from the dream. "I was shown that there is a political group which is highly distrusted and is known as 'THE 21". They were shown to mow their lawns in circles about 3 feet across such that the center of the circles were slightly higher than the grass around it. The circles were mowed in perfect rows of these circles. In a secondary view of the circles, it was like double circles linked together. Basically, all I was shown was how they mowed their lawns. " It wasn't until after I did my research and found some references to "THE 21" in two ways that I remembered that I had done this page about the terrorist bombings and it fit together. The first reference that fit was an article from Great Britain about 21 groups they were prohibiting, linked to Osama Bin Laden. The other reference was to Hezballah, which I had heard about but didn't pay any attention to in the past. This morning, I had a vivid set of visions - all showing me the Temple Tent. It was much divided, but I was told, "She will start the war". I've done a lot of research on this before as I've had a whole series of dreams and visions about this. Here is the page that I started a couple years ago - with the additions of today's visions plus a dream a young man had last month which was very revealing as well. His dream was about the year July 2567 and the number 21. Today's date 7-26-2004 adds up to 21. 5-9-03 - DREAM - I was in a huge room, where a meeting had been called. I was with a man named David. Something needed to be repaired. I was shown the female pattern for the repair. Then I was shown the male pattern for the repair. Then I was shown there was only one female patch and it had been placed inside a jar of some kind of crystalline fluid, and it was swirling in a circle. It seems that the female was an angel, who was to use this patch. I couldn't figure out how the angelic female patch could be used when it was in a closed jar. Then I was shown 25 of the male patches, but they were turned up and held up like shields and all of a sudden, all these men were on white horses and the men and horses became crystalline white - all lined up in a row like warriors, holding up their shields to fight in a coming battle. David said that he didn't feel right about something about this job, so I advised him, "If something doesn't feel right, the best thing to do is to go forward and move on!" It was time to leave then, and we crawled over a counter-like barrier in the doorway - out into a dimly lit hallway where some teenage girls were walking by. One of the girls asked, "Who are you?" I answered , "Me!" "Who is Me, she asked. I answered by pointing at myself, "ME!" My name was unimportant. I lay in the bed in the dark . . . awake, yet seeing somehow, thousands of white horses, with warriors dressed in white, riding in straight rows, like on a road, eight wide. They were riding down the front of my face from the top of my head. I could not recognize faces, nor race . . . it was all white. I lay in the bed in the dark . . . awake, yet seeing somehow, thousands, upon thousands of white horses, with warriors dressed in white, riding eight abreast in straight rows, like on a road. It was as if these horses were on two screens of television, one screen on each of my thighs, moving upward from my knees towards my body. These horses and riders too, were not recognizable as any particular race of people. Everything was white. I was afraid to move . . . afraid that if I moved that it would all disappear. Yet, it went on and on . . . endlessly. Finally, I had to move. However, it didn't end when I rolled over. The thousands of white horses with their riders continued to ride upward from my knees towards my body. There was no stopping them. REVELATION 9:16 "And the number of the army of the horsemen were two hundred thousand thousand; and I heard the number of them." Jesus said that Love is the most important thing. What has been called vertical love (towards God) and horizontal love (towards other people). "You have heard it was said 'Love your neighbor and hate your enemy'"
"But I tell you: Love your enemies and pray for those who persecute you, that you may be sons of your Father in heaven." Jesus also taught about the priorities of life. Jesus taught about our attitudes to other people, and warned of the consequences of getting it wrong. Jesus not only taught us about our attitude to weak and vulnerable members of society, such as children, but used them as an illustration and example for our own attitudes. At the time John sees the great multitude in heaven the great tribulation has already begun on the earth and the effects of the sixth seal have already been felt. The elder simply tells John that this great multitude was taken away from that great tribulation. They were rescued from it, and there is nothing that demands that they experienced any of it. The pre-trib rapture is not dependant on the twenty-four elders as being representative of the church. The great multitude is indeed the church, and it is taken from the earth immediately prior to the beginning of the tribulation, and prior to the effects of any of the twenty-one God-given end-time judgments that the earth will be afflicted with. This becomes clear once it is understood that the rapture occurs at the fifth seal (verify), the tribulation begins with the sixth seal (verify) and the 70th Week does not begin until after the first trumpet (verify). If this view is to be understood then a reformed view of the first four seals and the Four Horsemen of the Apocalypse is also necessary (here). Columbus came to America looking for the return of Jesus which he knew, according to prophecy, had to be in America. Columbus was a very religious man and he believed that he was fulfilling prophecy by coming to America. Columbus wrote his Book of Prophecy which he gave to the Queen and King of Spain in order to get money for his voyage. Upon entering the Gulf of Pariah and seeing the fresh water there, he proclaimed that he had discovered the Paradise of Adam and Eve where he believed he would find Jesus and the Heavenly Temple and the City of Gold (New Jerusalem), and usher in the 1000 years of peace. Columbus read the book of St. Brendan, and it had maps, graphics and directions to come to America, so when he sailed from Spain, he knew exactly where he was going. Before Columbus, the Vikings came to America looking for about the same thing. Where did this information come from that St. Brendan, the Vikings and Columbus used to come to America? The Vikings, being of the Dans and the originators of the prophecies of the New World across the Sea, were privy to this information, as they were knowledgeable in the Revelation of Moses. The civilization of Moses was a microcosm of the macrocosm. That is, Moses' microcosm was for a specific people, the twelve tribes of Israel, whereas Baha'u'llah's system is for the entire world. They, the Vikings, rejected Christianity because of the trinity—God the Father, God the Son and God the Holy Spirit—as they believed in the One God of Abraham, Isaac and Jacob. When Solomon and the tribe of Judah bowed down to idols (Ashtoreth and Milcom), the ten tribes separated from Reaboem, Solomon's son and successor, because of this Trinitarian Paganism that Solomon bowed down to. But their (the tribe of Dan's) religion was full of all kinds of promises, such as a new world coming. Therefore the Vikings made a number of trips across the sea to find the fulfillment of their promise. When Joseph Smith was 14 years old, he had a vision of the two Christs. He saw the Father and the Son as two separate people: Baha'u'llah and Jesus. Later Smith saw that the return of Jesus would be in America in the Temple described by Ezekiel in the Bible which would be located in the Rocky Mountains. Thus, up until the time he died in 1844 Smith directed his people to go to the Rocky Mountains "to prepare the way" for the return of Jesus. Mormons believe that the resurrected Jesus ministered to the Nephites in America. He appeared before a congregation in their temple, and allowed them to feel the wounds in his hands and feet. The Nephite world has its roots in the decay of ancient Israel in the sixth century BC. The tribe of Joseph gained a new start when the prophet Lehi rediscovered the lands we call the Americas. The majority eventually embraced the existing culture, and this came to shape the Nephite world (see 1 Nephi for details). He stayed with them for several days, teaching and healing. He called and ordained twelve disciples, and gave the people various commandments and the gift of the Holy Ghost. Jesus Christ also appeared to Joseph Smith in New York State in 1820 in what is known as the First Vision. He appeared to Joseph Smith on several other occasions. Jesus Christ has appeared to other Church leaders, for example in 1898 and in 1918. The whole idea of the "Gold Plates" actually originates within the ancient prophecy of Enoch preserved in Masonic tradition where Enoch is instructed to bury the "Gold Plates" in a mountain with the letter "M" written on it. He is then instructed to place the knowledge of how to obtain the "Gold Plates" into two structures—one a "pillar of brick" and the other a "pillar of stone." These two pillars of Enoch are described in The History of Josephus. The "pillar of brick" was destroyed during the flood. The "pillar of stone" is the Great Pyramid of Gizeh—a chronological and prophetic Book of Stone—the meanings of which Dr. Jensen has unraveled since his move to Missoula ("Masauwa" of the Hopi), and his wrongful imprisonment within Ezekiel's Temple (the "stone with seven eyes") in Deer Lodge. (In Chapter Eleven in this book I give a short version of Dr. Jensen's explanations of the Great Pyramid of Gizeh.) In Missoula, looking east past the University of Montana on Mt. Sentinel, is the mountain with the large "M" written on it which can be seen throughout the city, fulfilling the prophecy of the Masonic Legend of Enoch (see photo). The knowledge of the "Gold Plates" is also in our possession. 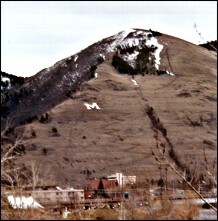 Photo of Mount Sentinel in Missoula. The "Mountain with the Letter 'M' Written on it"
Marriage was the rule at the time of Jesus and the expectation for Jews. It is especially true that a Rabbi was expected to be married. The disciples of Jesus called him Rabbi. The Gospel of Philip was uncovered with the other Nag Hammadi texts in Egypt in 1945. The Gospel dates to the middle of the third century, more than 200 years after Christ's death. In this text, Mary is described as a "companion" of Jesus. For those who support the idea that Jesus kissed Mary frequently on the mouth, there is no evidence that it was sexual in nature. Kisses were often a symbol of spiritual fellowship and that Mary herself was a symbol of wisdom. In addition to the suggestion of a kiss between Jesus and Mary, the Gospel of Philip also uses the word "companion" to describe her relationship to Jesus. The original word used in the text is the Greek word koinonos. The word is translated as "companion," but in Greek can also mean "wife" or "sister" in a spiritual sense. The Gospel of Mary (also called The Gospel of Mary Magdala) was also discovered in 1945 among the Nag Hammadi texts. It dates to the mid second century. This text is suggestive of a special relationship between Christ and Mary. However, Peter's surprise implies such favoritism was not a common occurrence. Levi says "He loved her more than us," an interesting statement to say the least. The passage does indeed show favoritism for Mary. We are tempted to believe that Jesus had a larger role in mind for Mary than simply traveling attendant. Traditionally, the Holy Grail has been thought of as the cup that the disciples drank from at the last supper and the one that caught Christ's blood at his crucifixion. The Templars have long postulated that the Holy Grail is actually Mary Magdalene herself. She is the vessel that carried the blood of Christ in the form of his child. The book Holy Blood, Holy Grail published in 1982 which postulates that the secret which The Priory of Sion is committed to protecting is that Mary Magdalene is the Holy Grail and that there is a holy bloodline descending from Christ. Another piece of circumstantial evidence to suggest that Christ was married is that the secret society, The Priory of Sion, was founded for the sole purpose of protecting this very secret and the descendants of Christ's bloodline. The existence of The Priory of Sion, founded in 1099, is based on Les Dossiers Secret, secret papers anonymously deposited at the French National Library in Paris. Turquoise, although dominant in the jewelry finds (for example several thousand pieces of turquoise were found in Chaco Canyon), it is not the only important jewelry find. The spiny oyster shell (Spondylus Princeps) is found in only one area in the Western Hemisphere- off the coast of Baja California. This shell has been found in abundance in archeological excavations of the Anasazi, Mogollon and Hohokam of the desert southwest. It has also been found in the same eastern mound excavations in which turquoise was also found. These finds not only prove early man and prehistoric man's interest and use of jewelry but it reveals important economic information. It shows the existence of trading in his lifestyle. It also provides a glimpse into probable status levels of the people. The Hopi and Pueblo cultures of the Rio Grande are descended from the Anasazi and many believe from the Mogollon and Mimbres as well, it seems to be a valid beginning of a historic tracing. Early American travelers in the Southwest were astounded to find ruined cities and vast cliff dwellings dotting the desert landscape. Surely, they thought, a great civilization had once flourished here. It looked to them as if the people who created it had simply walked away and vanished: the ruins were often littered with gorgeous painted pottery and also contained grinding stones, baskets, sandals hanging on pegs, and granaries full of corn. The Navajo Indians, who were occupying much of the territory where this lost civilization once existed, called them the Anasazi--a word meaning "Ancient Enemy"--and they avoided the ruins, believing they were inhabited by chindi, or ghosts. American archeologists focused on the Anasazi and their great works, and they became the most intensely studied prehistoric culture in North America. A standard picture emerged, based on wide-ranging excavations of sites and on detailed ethnographic research among the Hopi, Zuni, and other Pueblo Indian tribes, who are the Anasazi's descendants. The Anasazi were--so the findings suggested--peaceful farmers, and they attained astonishing results in engineering, architecture, and art. The center of this cultural flowering, from the tenth century to the twelfth, seems to have been Chaco Canyon, New Mexico, a windswept gulch in the apparently endless sagebrush desert of the San Juan Basin. Chaco is marked by immense stone structures, some up to four stories high, called Great Houses. The largest, Pueblo Bonito, contains some six hundred and fifty rooms, and its construction required more than thirty thousand tons of shaped sandstone blocks. The Chaco Anasazi also built hundreds of miles of roads that stretched out from Chaco Canyon across the landscape in arrow-straight lines-an engineering marvel achieved without compass, wheel, or beast of burden. They erected shrines, solar and astronomical observatories, irrigation systems, and a network of signaling stations. They constructed more than a hundred Great Houses outside Chaco Canyon, spreading them over fifty thousand square miles of the Four Comers region of the Southwest. Many of these outlying Great Houses seem to have been connected to Chaco by the radiating pattern of roads. Archeologists today call this cultural explosion "the Chaco phenomenon." But the phenomenon ended abruptly around 1150 A.D., when a vast collapse apparently occurred, and Chaco, along with some of the outlying sites, was largely abandoned. Equally remarkable was the Chaco society. It seemed to be almost utopian. The Anasazi, the traditional view held, had no absolute rulers, or even a ruling class, but governed themselves through consensus, as the Pueblo Indians do today. They were a society without rich or poor. Warfare and violence were rare, or perhaps unknown. The Anasazi were believed to be profoundly spiritual, and to live in harmony with nature. As a result, the Anasazi captured the fancy of people outside the archeological profession, and particularly those in the New Age movement, many of whom see themselves as the Anasazi's spiritual descendants. The ruins of Chaco Canyon have long been a New Age Mecca, to the point where one of the sites had to be closed, because New Agers were burying crystals and illegally arranging to have their ashes scattered there. During Harmonic Convergence, in 1987, thousands gathered in Chaco Canyon and joined hands, chanting and praying. People have also flocked to the villages of the present-day Pueblo Indians--the Hopi in particular--seeking a spirituality outside Western civilization. The Hopi Themselves, along with other Pueblo Indian descendants of the Anasazi, feel a deep reverence for their prehistoric ancestors. A people rich in culture, the 7,000-year-old Anasazi are the ancestors of today's Pueblo Indians. Their culture arose from even more ancient peoples in what is now the American Southwest. During their long history, the Anasazi evolved from a nomadic to a sedentary culture and existence. At first hunter-gatherers, in time the Anasazi began raising maize and other crops. They also produced skillfully woven baskets. By a.d. 700, the Anasazi were building pueblos, or villages, along with extraordinary pottery marked by elaborate black-on-white designs. Their villages, built at the top of mesas or in hollowed-out natural caves at the base of canyons, included multiple-room dwellings and complex apartment structures of stone or adobe masonry. Despite their successful culture, the Anasazi way of life declined in the 1300s, probably because of drought and intertribal warfare. Today, Pueblo descendants of the Anasazi still live largely traditional lives in the American Southwest, farming the land, weaving baskets, and making pottery. (8) Pueblo V (1600 to present). The Anasazi built the numerous communal dwellings, or pueblos, many now in ruins, on the high plateau of the southwestern United States. The oldest remains are in the Four Corners region, where Arizona, Colorado, New Mexico, and Utah adjoin. At the time of its greatest extent, the Anasazi culture was spread over most of New Mexico, northern Arizona, southwestern Colorado, and much of Utah. This is a region comparable in size to modern France, but great uninhabited stretches lay between the villages, which were located where water was available. Chetro Ketl is one of several large masonry structures, or "Great Houses," found in Chaco Canyon in northwestern New Mexico (U.S.A.). This 337-room, four-story building was constructed between A.D. 1010 and A.D. 1109 by the Chaco Anasazi, an archaeologically-defined society that occupied the high desert of the "Four Corners Region" from approximately A.D. 500 to A.D. 1150. Although Chaco Anasazi cultural traits have been found over a large area, the Great Houses of Chaco Canyon are believed to have served as the religious and probably political centers of Chaco society. These large masonry Great Houses have long attracted the interest of Southwestern explorers, archaeologists, and now tourists. Unlike typical Anasazi habitations, these huge structures appear to have been largely vacant and focused on ceremonial aspects of Chaco society. Excavations at Pueblo Alto, a Great House located near Chetro Ketl, revealed that few people lived in the structure. It instead appears to have accommodated large "feasting" events that led to the deposition of large quantities of broken ceramic vessels and food refuse. It is likely that other Great Houses in Chaco Canyon served a similar function. Aerial photography and ground survey has also identified the remains of prehistoric roads that led from many portions of the region to the Great Houses in Chaco Canyon, further indicating the importance of these structures to Chaco people. The discovery of ornate burials in Pueblo Bonito, the quintessential Chacoan Great House, suggests that these structures may have also served for the occasional burial of especially important people. In addition to the large above-ground masonry Great Houses, the Chaco Anasazi constructed large, usually subterranean Great Kivas , a tradition started by their ancestors and maintained by their descendents, but one which the Chaco people mastered. These Great Kivas could measure over 20 meters in diameter and have roofs several meters in height. They were usually, but not always, roofed, and the large pine beams necessary to accomplish this had to be imported from mountains 30-50 kms. away. These structures were often surrounded by exterior chambers, and in the classic example, Casa Rinconada, a hidden underground passageway led from one of these chambers into the main room of the kiva. The Anasazi culture is believed to have gradually evolved out of a nonagricultural base of the ancient Desert culture, once widespread in western North America, though precise evidence of the transition has yet to be discovered. It may have been in part derived from the Mogollon culture, an older tradition of settled agriculturalists and ceramics producers who flourished from c.100 b.c. to a.d. 1400 in the mountain areas of east central Arizona and west central New Mexico. There is much evidence of trade and cultural interchange between the Mogollon and the Anasazi. Anasazi culture was widespread and considerable variety exists within pottery. Archaeologists have categorized Anasazi pottery types into a number of wares, or groups of pottery types which share the majority of structural and decorative features. Within each ware, a historical sequence can be traced from the beginnings of Anasazi culture to the end. Bordered roughly by the Colorado River on the west and the San Juan River on the south, this area occupies the southwestern corner of Colorado and the southeastern corner of Utah. 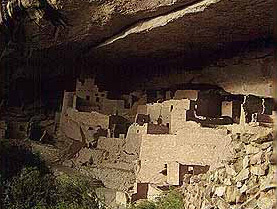 The region is alternately referred to as Northern San Juan or Mesa Verde. Big-game-hunting ancestors of the Anasazi had roamed the region for maybe 12,000 years before the time of Jesus. Nomadic hunter-gatherers periodically occupied caves and campsites in the area before the time of Jesus. (See the Northern San Juan Region Map). The Anasazi settled on mesas and in the flatlands in the Hovenweep area, west of Mesa Verde, around A.D. 500 and planted corn, beans, squash and watermelon in the rich soil. They also gathered wild plants and herbs like beeweed, ground cherry, milkweed, cattail, wolf berry and sedge grass. Permanent Anasazi pithouse settlements sprang up at Mesa Verde about 600. 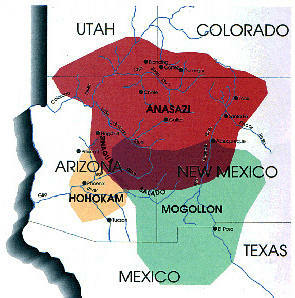 Anasazi population in southeastern Utah tripled by 750 as clusters of pithouse villages formed. Russell Burrows was walking along a wooden path and literally stumbled onto the opening. As he fell, he dislodged a massive stone that, if it had not jammed, would have flipped over and deposited him into a stone chamber that was 12 feet deep. The stone had then been designed to turn over and seal the intruder into the chamber... permanently. Instead, Burrows noticed the strange carvings and writings on the bottom of the stone and peered deeper into the cavern. On one wall was a huge face that had its eyes fixed on the deadly “trap door”. This nearly fatal discovery would begin a mystery that remains unsolved today. Another criticism is that the engravings do not fit with historical precedents as we know them, but could they represent something previously unknown to archaeologists? The carvings depict mostly warrior profiles, animals, and ships of many periods and traditions. We must also remember that the cave is also a mausoleum containing skeletons and grave furniture, weapons and urns. Whether or not these bodies have been studied closely is unknown. Filip Coppens, who writes about world mysteries in Belgium heard about the investigation of the anomalies surrounding the Egyptian hieroglyphs in the NSW Hunter Valley. He was struck by certain odd similarities between the two finds and took pictures of the carvings which depicted a wolf-headed god, similar to an "Anubis" carving photographed in the Hunter Valley. Curiously, there are even images of ancient Amer-Indians wearing feathers and facial designs, some showing clear Meso-American style head-dress. Records of ancient travelers? Amongst them are many ancient mystical and sacred designs, as well as maps, pictures of ships and non-indigenous animals. Astonishingly, one of the carvings portrays the cloven-hooved god Pan, holding his pipes and consorting with a nymph. Another stone (as well as an ancient metal coin) excavated from the cave carry the bold image of an elephant underlined with Hebrew characters. More than just pictures, there are numerous tablets with coherent linear script carved on them. Examples and influences appear to range from Hebrew and Sumerian to Roman, Greek and Egyptian. There are log tombs, skeletons and artifacts from the Adena culture, which is believed to have developed around 500 BC and to have died out by 200 AD. There was the Hopewell culture, 100 BC to 350 AD. A mysterious culture concentrated along the Mississippi, known as the "Mississippian", crystallized around 800 AD, and was thought to still be in existence when the Spaniards arrived. Researcher, Joseph Mahan, points out, that archeologists have collected evidence for fifty years of an elaborate and uniform Earth/Sun religion, associated with the building of flat top temple mounds, which spread out from the Mississippi in the later part of the first millennium. These pyramid-like mounds, which carried a permanent fire at the top, contained a variety of art, impressed on copper and stone, depicting animal-headed deities, crosses, swastikas, and people in ceremonial dress performing rituals. Examples of these mound sites are spread from Oklahoma, to Illinois, Alabama and Georgia. Could the Burrows Cave, indeed, be the lost library and resting place of the founders of this mysterious culture? Founders, the inscribed tablets purport to be, the ex-Egyptian Royal family escaping the sacking of ancient Egypt early in the first millennium? ... from God The Father and said: " Jesus, please cover me with Your Most Precious Blood." . ... Louise then said, " Jesus, please cover me with Your Most Precious Blood." ... when you believe in Jesus Christ in your heart, while one searches for 'truth'. ... She talked with a sweet voice and said she was Myriam, the Mother of Jesus. ... It fulfills a Biblical prophecy of Jesus coming back on a white horse. ... number of fish caught by the new Apostles when Jesus taught them how to fish. ... "Signs" = miracles; finger posts of God; proof that Jesus was sent from God.